Some foods it seems are timeless and never leave our shelves but menus have definitely changed since I was a little girl. I am a child of the 80's and I have fond memories of dinners at a Little Chef restaurant as a treat. We would try to be really good and clear our plates thinking on to what could be our reward. The Knickerbocker Glory would have caught our eye on the dessert menu. 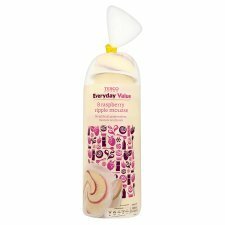 The main ingredients as I recall were basically ice cream, cherries and lashings of squirty cream and ice cream sauce. I think Little Chef could relive their former success if they embraced their retro routes. At home desserts were usually homemade. The choices in the supermarkets were much more limited than they are today and much more expensive. We usually brought ice cream in a cardboard box or choc ices. The picture on the right is of a big favorite, raspberry ripple mouses. Although, we didn't have a Tesco near us at the time so it would have been a different brand but it looked just the same and they are actually still around the same price. Raspberry ripple was usually one of the limited choices of ice cream flavours available at the time, not that I'm complaining, it was yum. I also remember Blamange or mouse, we would often have the powder that you would just mix with milk and pop in the fridge. After we had been swimming at Lux Park in Liskeard (which was completely different from today, none of the slides or flumes) we would then be aloud to chose a treat from the vending machine. 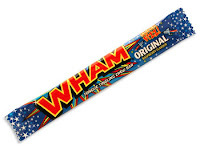 We would always choose a Wham Bar. We could go to the village shop with 10p and be able to choose from a dip dap, polos, an animal bar, a milky bar or penny sweets. Huba Bubba bubble gum would have been within our price range but we were never aloud it. We stock some retro sweets in our shops that I remember, I'm always tucking in to the black jacks. As I was only a child of this era I had no interest in the savoury items only the sweets but I know we never had what are now my favourite foods. Fajitas didn't seem to have made it into the UK in the 80's and the only curry we ever had was an English version containing raisins or apple.